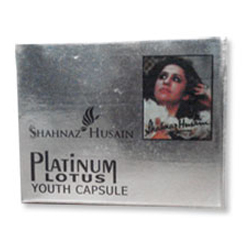 The encapsulated formulation for intensive skin care contains Platinum in a unique colloidal solution blended with pure plant extracts and oils like lotus, Himalayan cherry, malkangini, ashwagandha as well as olive, almond, sunflower and soya oils. Easily absorbed into the deeper layers of the skin it nourishes and strengthens supportive tissues delaying visible ageing signs. It helps to recharge and texturise the skin making it soft, smooth, radiant and youthful. Contained in a soft gelatin capsule, it is easy to carry and use. Cut or puncture capsule and apply contents smoothly over face and neck. Leave on. Each 300mg capsules contains Jaitun Tel, Badam Tel, Sunflower, Soya Oil, Kamal Pushp Extract, Malkangini Oil, Padmaka Extract, Ashwagandha Extract, Wheatgerm Oil.